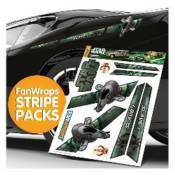 Star Wars Slave I FanWraps Car Decal: Take your vehicle from average to fantastic with FanWraps! The Star Wars Slave I FanWraps Car Decal is perfect for you! The slick stripes feature stickers of Boba Fett's Slave I, the Mandalorian symbols, the words, "Slave I," and the Star Wars logo! These great decals will express your fandom, improve your self-confidence and possibly even help you become one of the most feared bounty hunters in the galaxy, just like your hero Boba Fett. Show them your stripes! Ages 15 and up.